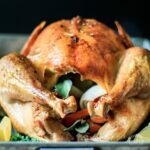 How to cook a turkey is an easy recipe for beginners that want to cook a whole turkey in a roasting pan without a rack for Thanksgiving. It shows you what herbs are best for seasoning a bird so your unstuffed turkey comes out moist when cooked in your kitchen oven. How to cook a turkey is a question that gets pondered a lot in the fall. 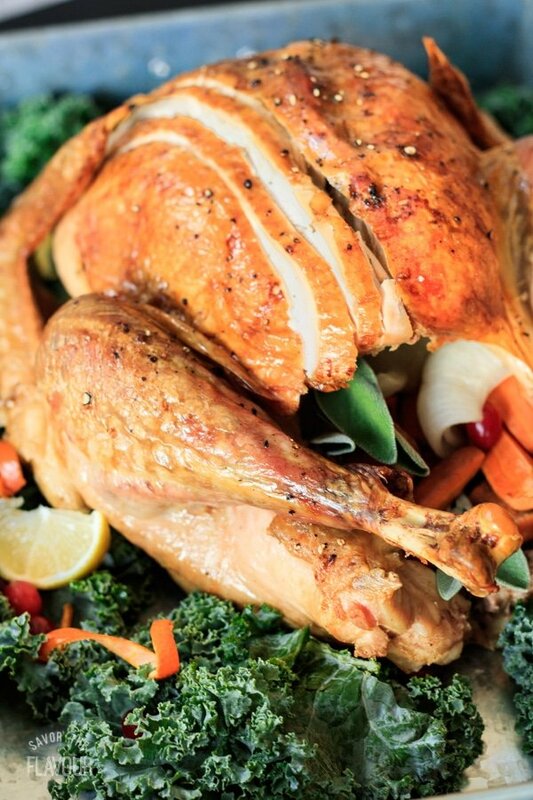 Since roasted turkey is a meat that will be forever associated with Thanksgiving, knowing how to cook one is a valuable skill every home chef should master. With my how to cook a turkey recipe, you can rest assured that your turkey will turn out when the big day arrives. As a child, I can remember Grandma’s roast turkey. The golden brown skin looked incredible and tasted divine. I would wait patiently for the slices of white juicy turkey to be carefully placed on my dinner plate. Grandma always gave me some of the skin too, which was the best part. My three girls are huge fans of dark meat, which suits me just fine because I prefer the white. Yes, white meat covered in golden brown giblet gravy with a crack of black pepper is what I crave on Thanksgiving day. Seconds anyone? My roast turkey recipe is easy and fool proof. The turkey is slathered in butter, stuffed with aromatics, sprinkled with salt and pepper, and placed breast side up in a pan of chicken stock. 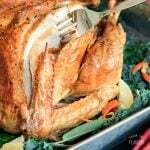 Roast the turkey for 13 minutes per pound at 350 F.
A 13 pound turkey will feed 13 to 14 adults. Let your turkey warm up to room temperature for 30 -60 minutes before roasting. Put the oven rack at the bottom, the turkey should roast in the center of the oven. Stuff the turkey with aromatics to flavor the meat from the inside out. Rub the turkey all over with butter and kosher salt, for golden brown, crispy skin. Start the oven at 400 F, then lower it to 350 F.
Use 2 cups of chicken broth, it will make a better tasting gravy than water. Put the turkey in legs first, this will allow the thighs to cook in the hottest part of the oven. If the turkey browns too quickly, cover partially with foil. Let the turkey rest, tented, for 30 minutes, this will let the juices redistribute. If you have never roasted a turkey, I encourage you to try it this year for the holidays. Serve your roasted turkey with these other classic dishes. The pleasure of a 5 star review of this how to cook a turkey recipe would be greatly appreciated. Allow your turkey several days to defrost in your refrigerator. It will take 3 to 4 days to thaw. 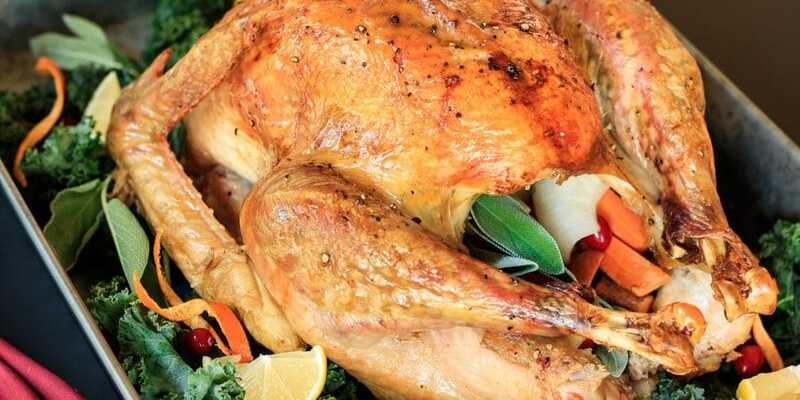 Take your thawed turkey out of the fridge, so it can warm up to room temperature. This can take 30 minutes to 1 hour. Remove the neck, giblets (heart, liver, gizzard) and possibly a gravy bag from the body or neck cavity. You can throw them out or keep them for giblet gravy. Clean the turkey inside and out by rinsing it with cold water. Place your turkey breast side up in the roasting pan and pat dry with paper towels. Lower your oven rack to the bottom third. You might want to take out the extra rack. Place the quarter onion, cut up carrots and celery leaves inside the cavity. These vegetables will flavor the turkey from the inside, but will be thrown out after the turkey is roasted. Crumple up your aluminum foil to cover the opening of cavity. For ease, leave the turkey un-trussed. Rub the turkey all over with softened butter and sprinkle with salt and pepper. Pour 2 cups of chicken stock into the roasting pan. Place the turkey uncovered in the oven. Decrease the oven temperature to 350 F.
Roast your turkey for 90 minutes. 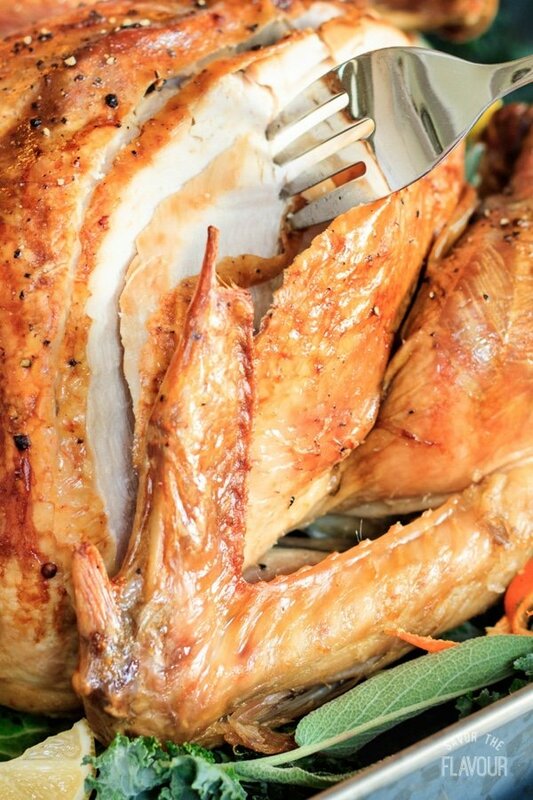 Using a turkey baster, a big spoon, or a ladle, baste the drippings all over the turkey. If the turkey is browning too quickly, cover loosely with foil. Using a meat thermometer, check the temperature in the deepest part of the breast or thigh away from any bones. The temperature should read 170 F, and the juices should be clear when the thermometer is pulled out. Let the turkey rest breast side up on a cutting board or on a large tray for 15-30 minutes. Cover it loosely with foil to keep it warm.